This Brand NewStrength Power Lifting Rack Is Inspired By Traditional Free Weight ExercisingAnd Fused With Today's Body Weight And Resistance Training Trends. This Is AnAll Inclusive Choice For Those Who Desire The Safety And Functionality Of ALifting Cage While Incorporating Additional Features That Allow The Unit To BeUsed As A Body Weight Station Or As A Resistance Training Tool. Power Rack IsLoaded With Comfort And Safety Features. The Main Frame Is Constructed FromSteel. 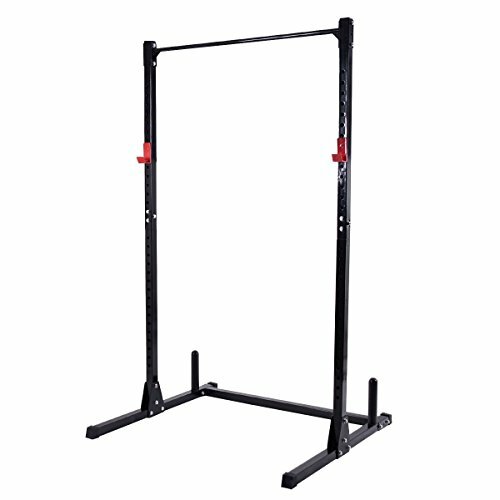 All Tube Seams Are Welded To Provide Additional Strength And Stability.The Overhead Workout Station Is Constructed From High Grade Tubular Steel WhichIs Fully Welded To Mounting Plates With Mini Gussets For Extra ReinforcedSupport. All Open Frame Ends Are Capped For Safety And To Prevent InnerOxidation. All Steel Components Of This Half Cage Are Powder Coated And Sealed.Don't Hesitate To Buy It! 【Heavy Duty Steel Frame】The power rack frame is made from heavy steel. It ensures the safety and sturdiness in use. 【Anti-Rust Surface】You don't have to worry about the power rack get rusty after long time use. It is easy to keep clean and ideal for years of use. 【Space Saving Unit】A great space saving unit for every home gym to target and strengthen core muscles in your humble abode with this power rack for home workout. If you have any questions about this product by Gymax, contact us by completing and submitting the form below. If you are looking for a specif part number, please include it with your message.